Eileen is new to San Clemente, but already realizes that the pier is at the center of our community. She recently decided to make San Clemente her home to be closer to her family, after 20 years in Santa Monica. With a BS in Biology and an MBA in Finance, she worked in project management roles for various industries. Her speciality is commercialization consulting for emerging biotechs. At this time in her life, Eileen is passionate about improving the quality of life for aging Seniors in South Orange County, serving on the Executive Committee of the Board of Supervisors' Senior Citizens Advisory Council (SCAC), as well as Secretary for the Housing & Transportation and Health & Nutrition subcommittees. Eileen wants to make our later years our best years. A 2015 graduate of Leadership San Clemente, she also serves as VP, Finance of the San Clemente Capistrano Bay branch of the American Association of University Women (AAUW). Eileen treasures our Pier, she wants future generations to find as much pleasure in the Pier as she does. After all, not everyone gets to live in a town with both a beach and a pier! Mikii moved to San Clemente 17 years ago while working as the Vice President of Brand Marketing for Sunstone Hotels. She knew right away San Clemente was where she wanted to plant her roots and pursue her entrepreneurial dreams. Dreams do come true. Mikii is the owner of San Clemente’s very own Neon Carrot Events. One of the best parts of her job is helping clients create life long memories whether it be planning their wedding overlooking the pier, a landmark birthday celebration or the grand opening of a new business. Mikii is passionate about keeping San Clemente a community where residents can live, work and play. She is active in the Chamber of Commerce, the Downtown Business Association, and is a graduate of the San Clemente Leadership Academy. Mikii volunteers with the American Legion Auxiliary’s’ Girls State program and serves on the California Girls State Alumnae Foundation Board of Directors. She and her husband love walking the pier and marveling over the paradise they get to call home. Jim is a retired federal law enforcement agent. Upon retiring, he ran a successful forensic accounting and investigations business. He has been declared an expert witness in both federal and state court relative to investigative accounting. More recently, he has devoted his life to his family and to his five grandchildren. He is active in San Clemente as Treasurer of Courtney’s SandCastle Charitable Foundation, the Friends of San Clemente Beaches Parks and Recreation Foundation, and the San Clemente Lifeguard and Junior Lifeguard Foundation. He is the bookkeeper forSan Clemente Ocean Festival, with financial oversight for over $700,000 given to the City of San Clemente. Jim is a graduate of the San Clemente Leadership class and the Orange County Sheriff’s’ Citizens Academy. He received the 2013 Outstanding Lifetime Achievement Award from the Chamber of Commerce and the San Clemente Spirit Award by Senator Mark Wyland. In 2015, he was named to the San Clemente Wall of Recognition. The San Clemente Pier first came into Jim’s life when he visited and fished with his uncle when Jim was a young boy. Lori believes that anticipating needs of future generations is essential to ensuring San Clemente’s place as one of the best beach cities in California. She is a former San Clemente mayor and was named San Clemente Citizen of the Year in 2011. She served 12 years as a San Clemente city council member, and in that time led efforts for the Safety Quiet Zone along the coast’s railway and launched the popular summer trolley which links the Pier with other parts of town. A graduate from Northwestern University with a B.S. in Linguistics and Education, Lori received an MBA from Kellogg Graduate School of Management. She enjoyed a 20 year career as a business executive in the communications industry. Most recently, she has taught for a decade at St. Margaret’s Episcopal School. She is active in the San Clemente Rotary and a member of Casa Romantica Cultural Center and Gardens and the Historical Society Dolphin-spotting with her husband and kids is definitely her favorite pier activity. Since moving to San Clemente in 1994, Peggy has devoted herself to San Clemente’s beaches. Beginning in 1995, she served as a volunteer and board member for San Clemente Ocean Festival and went on to be Executive Director for this event since 2001. 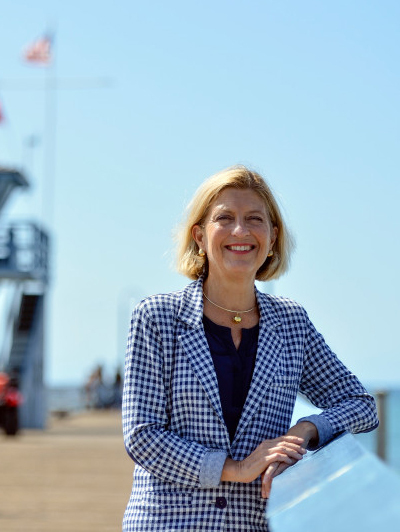 She served as a Beaches Parks and Recreation Commissioner 2002-2008, currently serves as a director on the Friends of San Clemente Beaches, Parks & Recreation Foundation, and served as President from 2014-2016. She also served as event coordinator for Celebration of Surf to commemorate San Clemente’s 75th anniversary. Peggy received the 2015 Chamber of Commerce Lifetime Achievement Award and was added to the City's Wall of Recognition in 2017 for these and other accomplishments. You can often find Peggy at the San Clemente Pier with family and friends at Fisherman's Restaurant, or walking the pier and feeling the waves pounding underneath, taking in the views of the surf and spray along the coast with the pier bowl as a backdrop, or catching a sunset. She strongly believes the pier is an asset worth protecting in our Spanish Village by the Sea. John serves on the San Clemente Beaches Parks and Recreation commission and has experience with fledgling foundations, having been a charter member of the Courtney’s SandCastle Foundation. He is a retired teacher who taught Biology, Chemistry and Marine Science at San Clemente HighSchool for 35 years. He also coached swimming, water polo, football, basketball, cross-country and track. He enjoys swimming, body surfing and skiing (a former member of the Mammoth Mountain ski patrol). Don Brown serves on the City of San Clemente's Planning Commission. He moved to San Clemente after a 40 year career in Aviation both with the Marine Corps and the Boeing Company. Marine Corps career included 325 Combat Missions and a ground tour as a Forward Air Controller with the Korean Marines, both in Vietnam. Assignments included Top Gun, Navy Test Pilot School, and Command of an F-18 Squadron. With Boeing served as a Test Pilot on numerous Commercial aircraft and assigned to the US Air Force C-17 Program as Company Experimental Test Pilot with eventual assignment as Chief Pilot. Before retirement was the Director of Flight Operations for all Boeing Airlift and Tanker Programs. San Clemente activities include Board Member with the Boys and Girls Club and Past President of the Board, also Board member San Clemente Exchange Club. A Nine Year Member of the San Clemente Planning Commission including three years as Chair. Five years as Planning Commission member of the San Clemente Coastal Advisory Committee. Signifiant Pier-related contributions include helping create the Local Coastal Plan for the Coastal Commission and guiding Sand Replenishments effort for our beaches. Don is the Publisher of the San Clemente Journal, one of the most respected regional publications in Orange County. He is a 35-year resident of San Clemente. He began his typesetting, photography and graphics agency in 1984, and has published the community quarterly San Clemente Journal for twenty years. Don writes about and photographs the residents, the history, and the current events that celebrate life in San Clemente. Don has served as President of the Chamber of Commerce, the San Clemente Kiwanis Club and the venerable San Clemente Dons. He was a founding board member of the Friends of San Clemente Beaches Parks and Recreation Foundation, the Sports Hall of Fame selection committee and The San Clemente Political Action Committee. He is also a member of the Downtown Business Association, the San Clemente Historical Society, and an advisory board member of the Boys and Girls Club of the South Coast area. Don believes the pier is the centerpiece of our community and needs to be cared for. Joel is a graphic designer and co-owner of Property Media Services and Calderon Films. He recently returned home to South Orange County from North Carolina because of his love for his family, the ocean, and vintage custom cars. Joel is an enthusiastic believer in the importance of the San Clemente Pier and donated his services to create the PierPride website and a presence on other social media. While in North Carolina, Joel volunteered with ibike4them.org to help raise money and awareness for three local charities. Many summer days were spent with his cousins at the San Clemente Pier. Randy Little is Maintenance Manager with the City of San Clemente. He is the city staff liaison to PierPride. Randy oversees maintenance of the San Clemente Pier, beaches, parks, streets, city facilities, traffic signals, street lights, parking operations and street sweeping. Prior to coming to San Clemente Randy worked for the City of Santa Monica. His duties included the maintenance and preservation of the Santa Monica Pier. He has a deep appreciation for the unique challenges associated with city stewardship of a public pier. From routine maintenance to careful structural preservation, keeping San Clemente pier a safe, welcoming beach destination for the millions of annual visitors is a top priority for Randy. Randy takes pleasure in seeing folks of all ages enjoy the pier. Tower Zero, the home of San Clemente Marine Safety is on the pier and is regarded by Randy as a key pier feature.